If you're reading this blog, then more than likely you're a fan of PrestaShоp, one of the most progressive e-Commerce platforms. And if you love PrestaShоp and want to start a new e-Commerce site or migrate from existing one you have to PrestaShоp, then we have good news for you! We’ve teamed up with TemplateMonster to give you an opportunity to win a premium PrestaShоp theme. Actually, the guys from TemplateMonster.com will choose 3 winners and each winner will get a PrestaShоp theme of his/her choice. Moreover, you will get a bonus from Cart2Cart! Read on to get a details. 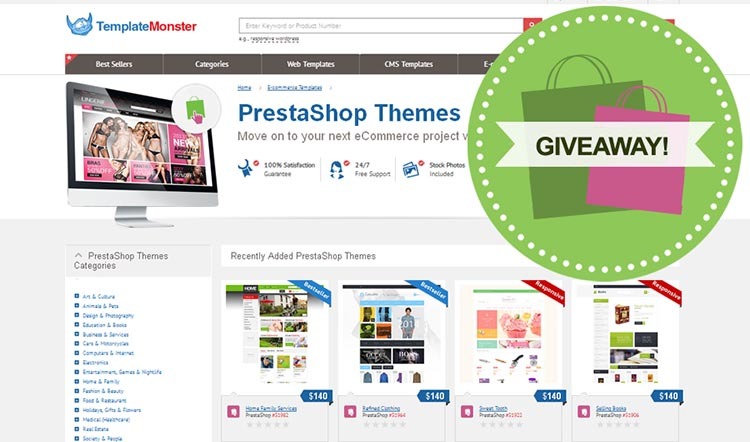 Look through TemplateMonster PrestaShоp themes and find the one you would like to win. Btw, you can either browse all PrestaShоp themes which are available at TemplateMonster or, you can visit this page and see top 10 PrestaShоp themes based on customer reviews. Then come back to this post and leave a comment with the theme ID. For example, you can write “I want to win PrestaShоp theme #50483”. Three winners will be chosen at random and contacted by email. Submit your comment before December 23, 2014. Leave your real email address. Of course, we will only contact you if you win. In other words, you can win a stunning design for your PrestaShоp site by simply telling us which TemplateMonster PrestaShоp theme you like best. Cart2Cart as well has a small gift for you our dear customers! Additionally, to a free template those 3 winners are going to get 30% 20% and 10% discount for PrestaShоp migration! So, hurry up and good luck to all of you!